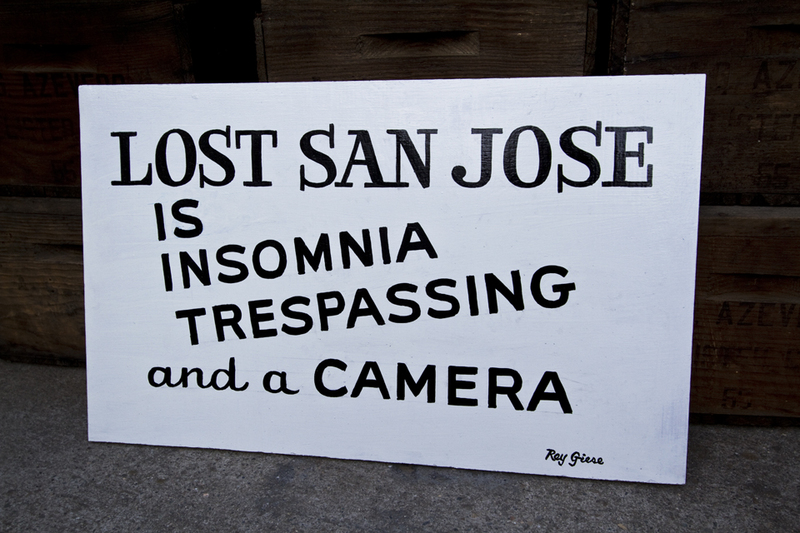 Over the years I have been photographing San Jose, there was a name I saw all over town. It was on every hand painted sign in every neighborhood. It was on trucks and store front windows. It was even on Christmas decorations perched on the lawns of local homes. Rey Giese. I wondered who this sign painter was, and fantasized about what a unique and diverse portfolio he must have. I thought about how cool it would be to meet him and hear what he had to say about it all. Then 8 years ago I did, in what couldn’t have been a more random circumstance. At the time I was working as a bank teller, taking in an endless stream of deposits. One day I notice the deposit I was holding in my hand had the name I had seen a thousand times. I looked up at a slender man, his face almost lost behind a massive pair of glasses, wearing his own name and logo on a sweater, a man who had to be in his 80s but moved with a steady hand as he passed each piece of paper over. I had to ask. His face lit up and he told me stories of all the things he painted with pride that few people take in their work. He told me he had been doing it since 1935. He told me about his upcoming projects, but cut my questions short because he was off to do more work. A few years down the road my wife, a reporter at the time, had an opportunity to interview Rey in his studio garage, something I’m still jealous about. When I came home that night I begged to see the photos of his studio and hear the stories he shared. As my wife clicked through the photos one popped up of Rey holding a sign that read, Lost San Jose. Apparently during the course of the interview my wife mentioned that I was a big fan of his work, even showing him a few of my photographs of San Jose. Without hesitation he pulled out some paper and drafted up a quick sign, committing it to wood with the same swiftness. I decided the only way I could pay him back was to give him a photo of mine, but when we tried to arrange a meeting to thank him his wife kindly informed us that Rey was no longer interested in talking with the media, and was too busy to meet. I was heartbroken that I couldn’t thank him in person, but I was lucky enough to have a piece of Rey’s work to call my own. For what it’s worth, Thanks for the sign, Rey. I learned recently that Rey passed away last month, leaving behind what his family believes is over 20,000 hand painted signs. All I can say is that Rey was a legend and a hardworking man who leaves behind a legacy many artists and painters and businessmen can only dream of. He was a talented and dedicated man, and I am honored to have a piece of his work in my home.